You can make this monster wreath for Halloween in about 10 minutes. That makes it the perfect way to kick off Craft Lightning Halloween edition! All week I will share Halloween crafts that can be made in 15 minutes or less and link to other blogs that are joining in the fun. To see today’s crafts, just scroll to the bottom of this post then stay tuned all week to get lots of great ideas. This one was originally posted over at Crafts Unleashed where I am a paid design team member however all projects and opinions are my own. Please note that links may be affiliate links which means you do not pay anymore but a portion of your purchase will go to support this site. Wrap the feather boas around the wreath form and secure with hot glue. I used three and it was JUST enough. If you like a fuller wreath, be sure to pick up four for this project. TIP: Use low temperature hot glue in order to keep the foam from melting when you apply the glue. Add the large googly eyes to the center of the wreath with hot glue. Secure them on both sides to the wreath as well as in the middle to each other. 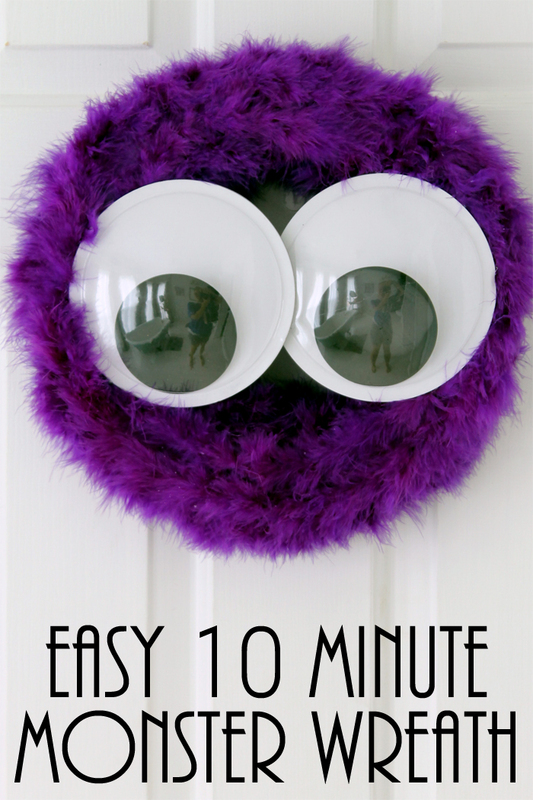 Your monster wreath is ready to hang on your door! I told you this was one quick and easy wreath project that is perfect for Halloween. Change up the color with another feather boa to make this a wreath that is all your own. Your kids will love this project and how it looks on the front door. Want to get extra points? 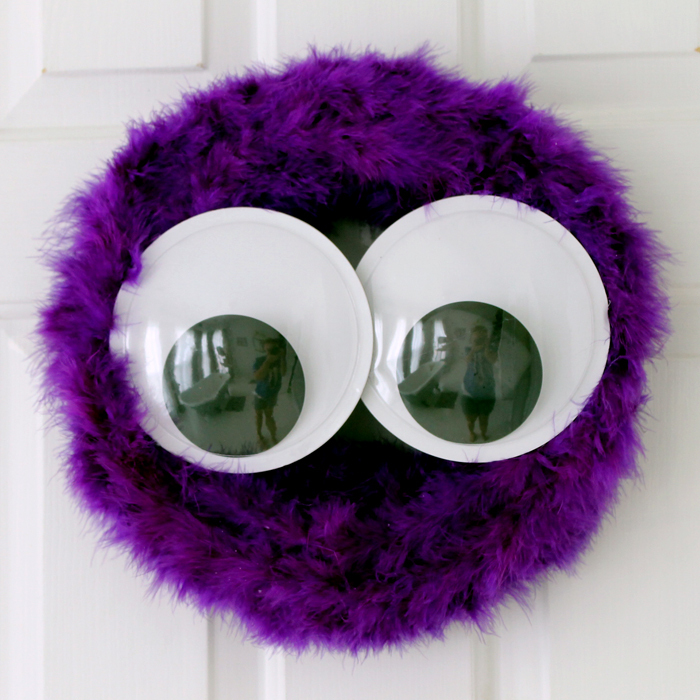 Add a monster wreath to the doors of their room! They will love this touch of Halloween decor. 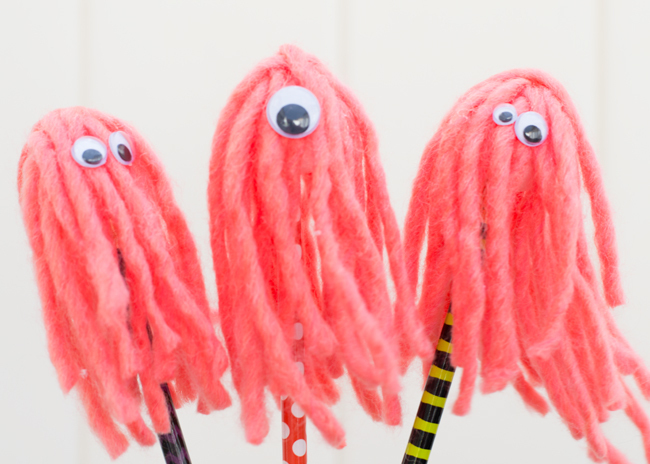 Now for even more fun Halloween projects that can be made in 15 minutes or less. I love this calligraphy wood sign from Doodle Craft. Let her share how to gain the confidence to do your own hand lettered sign. 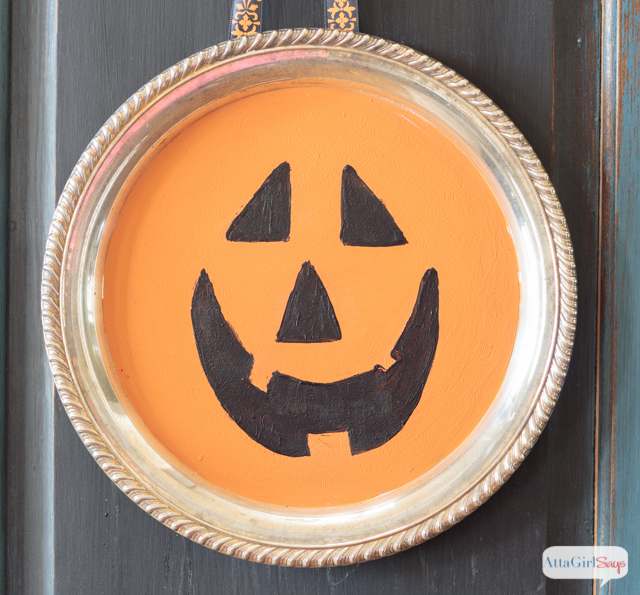 Pick up a tray from the thrift store and add a little paint to make a jack-o-lantern tray like this one from Atta Girl Says. 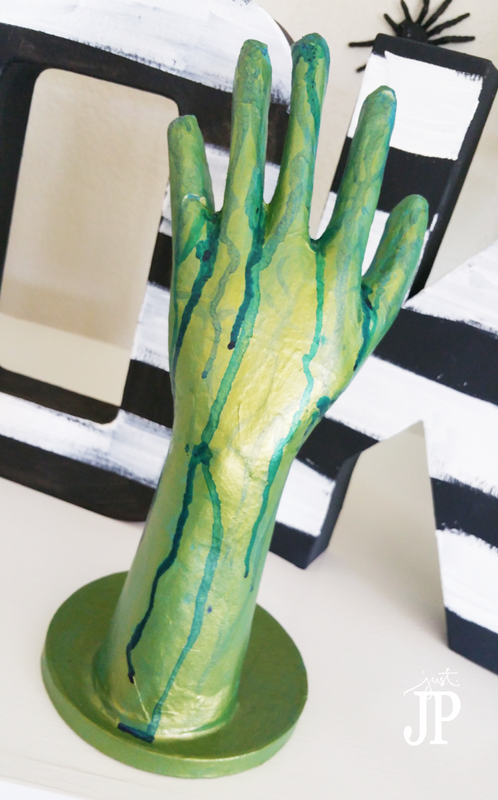 A zombie hand like this one from Just JP will look great in your scary Halloween decor. Add some fun to the tops of pencils with this tutorial from Frenchie Wraps. These would be perfect for a Halloween party! 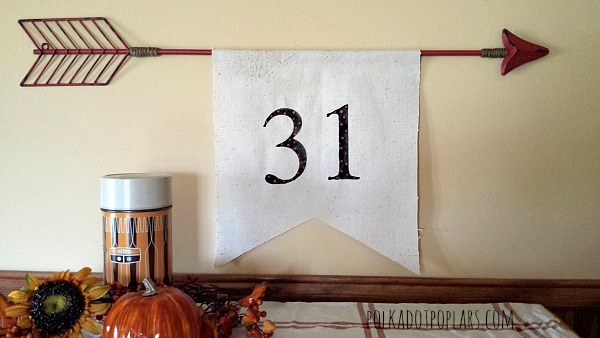 Polka Dot Poplars is sharing how to make this fun Halloween pennant flag. 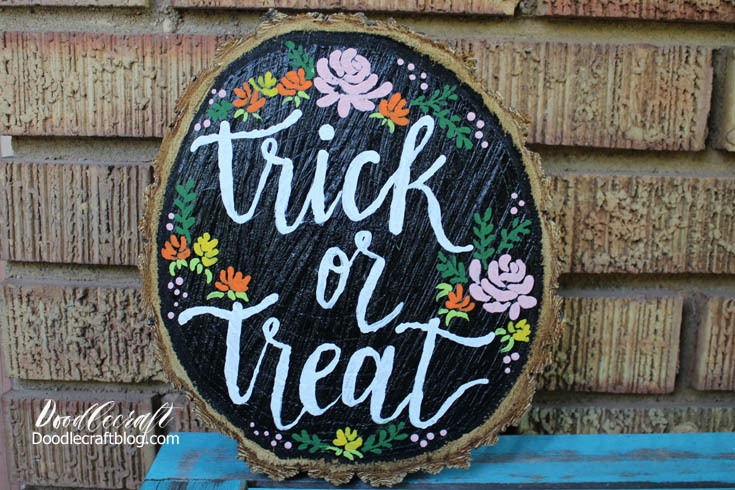 A quick and easy way to add some cute Halloween decor to your home. 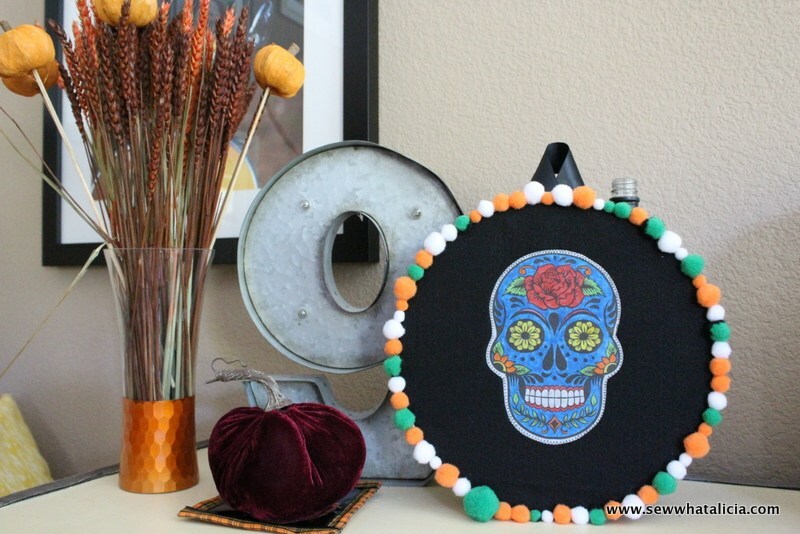 If you love sugar skulls, you will want to get started on this embroidery hoop art from Sew What Alicia! Make this monster wreath for Halloween of any of these other quick and easy Halloween ideas. Stay tuned all week as we have even more in store for you! Squee!! 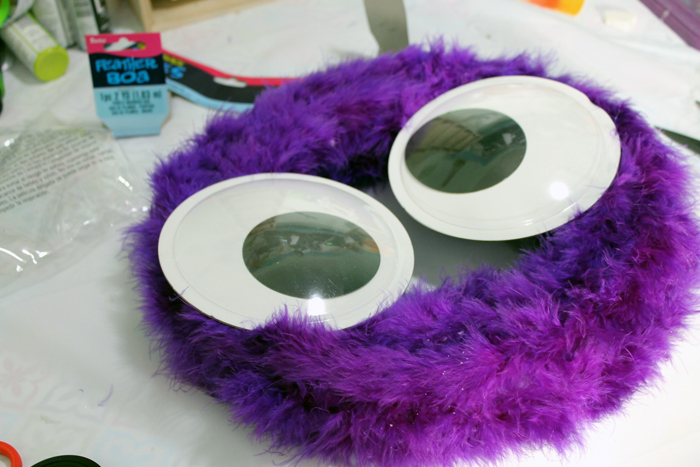 Feather boa and giant googly eyes!? LOVE!! So stinkin’ cute! Love your wreath, Angie! This made me laugh so hard! I love it! Perfect for Halloween! Thats fab, perfect for a party! Those giant googly eyes are just brilliant. I love it! I had no idea you get 6″ google eyes! I’ll keep a watch out for that! Too cute and i think I have those eyeballs!Thanks for linking up to Merry Monday! Pinned! Have a great week! There is so much that can be done with this adorable yet scary wreath…add a red tongue, crazy hat, dangley arms or legs or BOTH! Love this and it’s so kid friendly! Great idea!! And can be used for many other holidays as well! I went to Dollar Tree today, grabbed the googly eyes and the wreath holder. They didn’t have purple yarn, so I grabbed two purple and black tinsel garlands and I wove the garlands around the wreath wire. It looks okay. I haven’t glued the googly eyes to the tinsel yet. I will next month, in time for Halloween. YAY! So glad you made one!